The Grand Duchy of Baden was the First German State to inaugurate the EISENBAHN or TPO system on 1st April, 1848 at HEIDELBURG on an outgoing mail train. Offices were also established at the Terminal Stations of Karlsruhe, Basel, and Konstanz. In the 1850's the railway network spread far and wide and the TPO service began. Regardless of how long or short, a route was served by a TPO. One very short route with a TPO service was Baden-Baden to Oos. The Heidelberg post Office was transferred to the newly built railway station in the Rohrbacher Str., as it was intended to forward as many letters and packets as possible by Travelling Post Office. Further routes were established through the Duchy as the scope of the Railways and its complementary services increased. In later years the railway stations along the original route were re-designated with Numerals. The first, in 1855, was BASEL "174". 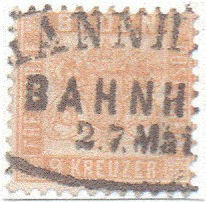 Later, the circular "BASEL BAHNHOF" postmark was used. BADEN BADEN station was Numeral "175" from 1856. MANNHEIM station was designated Numeral "174" from 1856. This later changed to MANNHEIM BAHNHOF, an example is shown. Earliest postmarks of Grand Duchy of Baden came in blue and Red and are rare in their own right. The short life span of BADEN postal administration created no less than 13 different TPO Postmarks on its railway routes before the services and territory were amalgamated with the North German Confederation which later became Deutches Reich. Appenweier - Kehl on 1st June 1844. Baden-Oos - Baden-Baden on 27th July, 1845. The railway reached Basel in 1855, through Waldshut forest in 1856 and on to Constance in 1863. 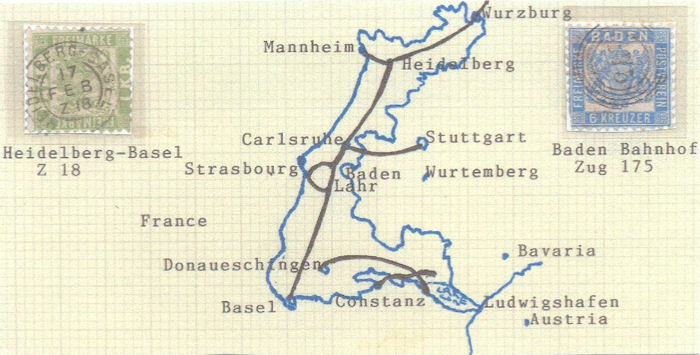 The 414.3 km long Baden main-track was completed after Mannheim to Basel route through the Lake Constance area and an important North-South axis was realised. 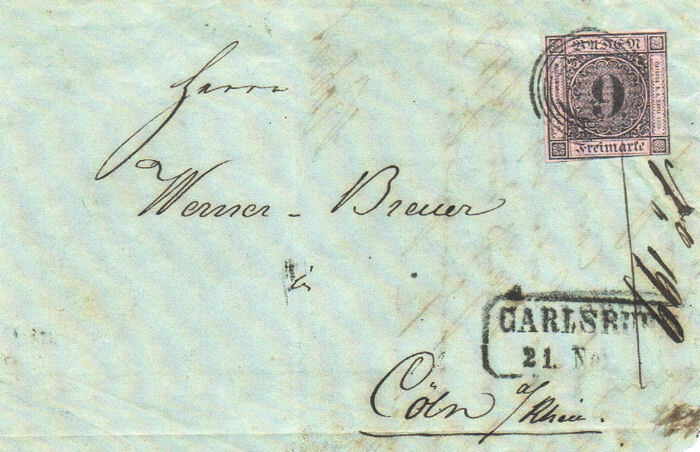 One of the earliest covers bearing reference to the railway is dated 25th September, 1849 from Darmstadt to Carlsruhe. 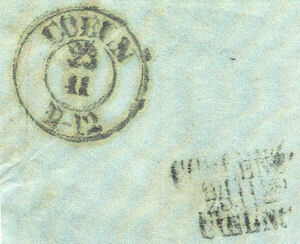 The TPO (Eisenbahn) postmark on this stampless cover is oblong in black and reads "E.B. 25. SEP.49 Curs I". The symbol following the 'Curs' (route) shows the direction of trip, either 'Inbound or Outbound '. Early TPO covers exist with Curs I to XII (twelve routes). Rail regulations required that these early markings always be stamped at the back of the cover. 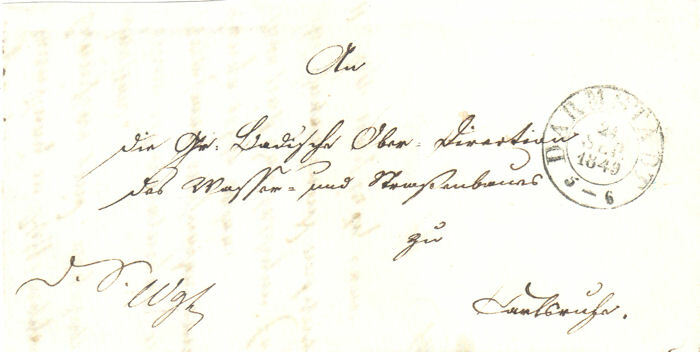 The following letter, dated 10th November 1855, left CARLSRUHE for COELN on 2lst Nov. by Baden Eisenbahn TPO route III, inbound run (Curs III *). It reached its destination via a second TPO route (Prussian Eisenbahn) COELN-COBLENZ on 23rd of November and received a COELN back stamp postmark. Front of Carlsruhe to Cöln cover. Again, route markings are stamped on the back of the cover as per rail regulations. Characteristics of the above Bahnpost Postmarks, including periods of use of most types of TPO postmarks, may be found in the Bahnpost Postmark catalogue available from the Society Library .